J Crew Factory’s checkered scarf (40700, $46.50) comes in flame or red (stock pic). 100% acrylic. Flame – The size is very generous. 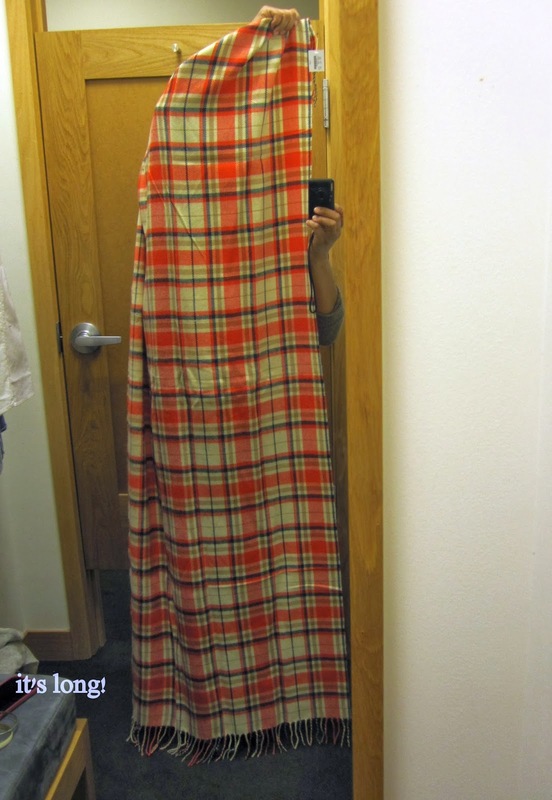 Some ladies have had trouble tying the 50″ x 60″ Zara checked scarf. . I have camel and it’s definitely blanket size. This Factory scarf is very long, but it’s rectangular in shape. That makes it easier to style. It can be styled! Trying it on with the mren’s Donegal shawl-collar cardiagn (S). The size felt right, but I would be curious to see how the XS fit. They didn’t have any to try in-store. I love the bright color. The acrylic was soft. Great blog! Do you have any tips and hints for aspiring writers? I’m planning to start my own website soon but I’m a little lost on everything. Would you suggest starting with a free platform like WordPress or go for a paid option? There are so many choices out there that I’m completely confused .. Any suggestions? Bless you! I as well as my pals have been analyzing the best things found on the blog and then instantly developed a terrible suspicion I had not expressed respect to the blog owner for them. All the ladies came as a result glad to read through all of them and have now seriously been making the most of those things. Thanks for truly being really kind and also for going for varieties of superb subject matter most people are really desirous to discover. Our own honest apologies for not saying thanks to you earlier. I just want to tell you that I am just new to blogs and really savored you’re web blog. Most likely I’m likely to bookmark your blog post . You certainly come with exceptional stories. Thanks a bunch for sharing your web-site. I just want to say I’m very new to weblog and definitely enjoyed this page. Almost certainly I’m likely to bookmark your blog post . You definitely have amazing article content. Kudos for sharing your website page. I simply want to say I am just very new to weblog and certainly liked your web blog. Probably I’m planning to bookmark your blog . You amazingly have very good articles and reviews. Thanks for sharing with us your blog site. I simply want to mention I’m new to blogging and site-building and honestly savored this web blog. Almost certainly I’m want to bookmark your website . You really come with superb posts. With thanks for sharing your blog site. I just want to say I’m very new to weblog and seriously loved your web-site. Very likely I’m going to bookmark your blog post . You certainly have superb stories. Regards for sharing your webpage. I just want to tell you that I’m beginner to blogging and absolutely enjoyed this web-site. Most likely I’m planning to bookmark your site . You definitely come with terrific writings. Appreciate it for sharing your website page. I simply want to say I’m very new to weblog and definitely loved this page. More than likely I’m going to bookmark your blog post . You actually have really good writings. Bless you for revealing your blog site. I simply want to tell you that I am newbie to blogging and site-building and actually savored your page. More than likely I’m likely to bookmark your blog post . You definitely have remarkable posts. With thanks for sharing with us your website. I simply want to tell you that I am just beginner to blogging and certainly liked your web blog. Probably I’m want to bookmark your blog . You really have remarkable articles. Thank you for sharing with us your webpage. I just want to say I am very new to blogging and actually savored your blog site. Likely I’m planning to bookmark your blog post . You absolutely have perfect articles. Thanks a lot for sharing with us your website. It is in point of fact a great and useful piece of information. I’m happy that you simply shared this useful info with us. Please stay us informed like this. Thank you for sharing. I truly wanted to post a comment in order to express gratitude to you for all of the stunning guides you are giving on this website. My time intensive internet search has now been compensated with sensible strategies to go over with my friends. I would mention that many of us readers are truly fortunate to exist in a notable website with so many perfect individuals with insightful tactics. I feel extremely fortunate to have come across your entire weblog and look forward to many more cool minutes reading here. Thanks once more for a lot of things. Great – I should certainly pronounce, impressed with your site. I had no trouble navigating through all tabs as well as related info ended up being truly easy to do to access. I recently found what I hoped for before you know it in the least. Reasonably unusual. Is likely to appreciate it for those who add forums or anything, web site theme . a tones way for your client to communicate. Nice task. I¡¦ve been exploring for a bit for any high quality articles or blog posts on this sort of house . Exploring in Yahoo I at last stumbled upon this web site. Studying this information So i¡¦m glad to convey that I have an incredibly just right uncanny feeling I came upon just what I needed. I so much for sure will make sure to do not forget this web site and give it a look on a constant basis. hello!,I love your writing so much! proportion we be in contact more about your post on AOL? I need an expert on this area to solve my problem. Maybe that’s you! Looking forward to look you. Hi, I do believe this is a great web site. I stumbledupon it 😉 I may return yet again since i have book-marked it. Money and freedom is the best way to change, may you be rich and continue to help others. Good post. I learn something totally new and challenging on sites I stumbleupon everyday. It will always be helpful to read content from other writers and practice a little something from other web sites. May I simply just say what a relief to find a person that really understands what they are discussing online. You certainly know how to bring a problem to light and make it important. More and more people should check this out and understand this side of your story. I can’t believe you’re not more popular because you most certainly have the gift. Hi, I do think this is an excellent site. I stumbledupon it 😉 I’m going to return yet again since I bookmarked it. Money and freedom is the best way to change, may you be rich and continue to help other people. Hi, I do believe this is an excellent blog. I stumbledupon it 😉 I am going to return once again since i have book marked it. Money and freedom is the best way to change, may you be rich and continue to guide other people. Hi there! I could have sworn I’ve been to this blog before but after browsing through many of the articles I realized it’s new to me. Anyways, I’m certainly delighted I stumbled upon it and I’ll be bookmarking it and checking back often! Anyways, I’m certainly pleased I came across it and I’ll be book-marking it and checking back frequently! This is a great tip particularly to those new to the blogosphere. Short but very precise info… Appreciate your sharing this one. A must read post! Hello there, I discovered your blog by the use of Google whilst looking for a related matter, your site came up, it seems good. I have bookmarked it in my google bookmarks. Great ¡V I should definitely pronounce, impressed with your site. I had no trouble navigating through all the tabs as well as related information ended up being truly simple to do to access. I recently found what I hoped for before you know it in the least. Quite unusual. Is likely to appreciate it for those who add forums or something, web site theme . a tones way for your customer to communicate. Excellent task.. Some of this informative articleis stated sources may false Please enable this article by looking for better trusted sources, or by checking whether the referrals meet the criteria for reliable sources. Citations that were unreliable erased or might be challenged.